Encouraging college students to include the Bible in their higher education experience, College.Bible points people to scripture. A project of InterVarsity Christian Fellowship, College.Bible serves as a portal for biblical resources, directing students to the Bible to answer questions related to spiritual things. Having a profound impact in culture for centuries, the Bible is a cultural artifact. Even if you approach it from an historical perspective, it is impossible to understand Western culture without learning the truths contained in the Bible. And literature lovers, can find almost all of the genres at their fingertips. College.Bible encourages readers to stop ignoring the problematic texts of the Bible. Because of this truth, College.Bible wants to inspire us to use the hard questions to take us deeper into scripture. One way to really dive in to scripture is to explore them with others. The best journeys are undertaken with partners, and exploring the Bible in the company of friends (or even strangers) is essential for diving into its depths and ascending its heights. Offer Bible studies, large and small gatherings, leadership training, and events. 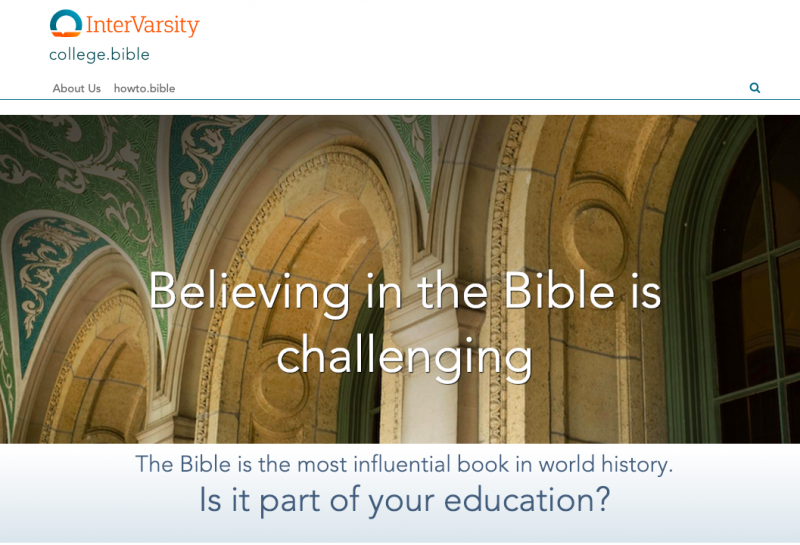 Since inductive Bible study has been at the core of InterVarsity, College.Bible and its drive to get people into the Word is a natural step in the digital age. IV has seen God transform thousands of students and faculty through the Word over the years and develop them into fully devoted and lifelong disciples of Jesus. Believing in the Bible is challenging? Political? Important? Outdated? Life-Giving? Right now, you can register a new .BIBLE domain name for 50% off regular pricing! Register today!